One of the amazing things about living in a foreign country is learning and experiencing the different cultural holidays and celebrations. Many of these celebrations and holidays are similar to those in North America, but some are not even close to what we are accustomed to. Some of the traditional celebrations here in Guatemala are quite fun (fairs and parades), some quite interesting (Running of the Torches), and some just plain creepy (Day of the Devil). Last week (Feb. 18) was the first day of Lent and was celebrated by throwing hollowed out egg shells filled with confetti, flour, and other things. This tradition is fun (so long as you don’t get hit), interesting (because it’s unique), and creepy (depending on what’s in the egg). We stayed indoors as much as possible. When we talk and share about the orphanage, we often leave out the fact that we have a staff of very dedicated men and women. Perhaps our hardest working group of employees are the house parents that take care of the children on a day-to-day basis. They are in the trenches (so to speak) everyday and every night. Because their jobs are difficult, demanding, and stressful, we as directors enjoy getting together with them in a non-work atmosphere. We recently split them into male and female groups, and went on outings. The men hiked to a natural hot spring and cooked lunch over an open fire, while the ladies went to the local coffee shop. It was great to hear them laugh, talk, and enjoy themselves. Because boys will be boys, they often need reminders as to how they should behave. Some of our most rewarding moments are sitting down in the boys’ home and explaining their God given responsibilities and purposes. They are always respectful (well almost always), eager to learn, and they may forget what we say as soon as we walk out the door, but more often than not they actually apply the lessons they receive. In a culture where boys are taught that they are superior to girls, teaching them differently can be a real challenge. It’s also more difficult to keep a straight face during a serious conversation, when they do things that are naturally comical. Please pray for these boys as we attempt to grow them into strong Christian men. 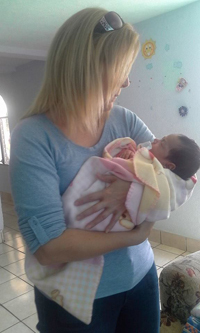 We’ve been blessed at the orphanage with an influx of babies. As everyone knows, babies change the atmosphere of a home and we’ve decided to take full advantage of this. The guidelines of the orphanage are to only receive children between the ages of 3 and 12, but when we started receiving calls for babies I (Bryon) felt that God wanted us to say yes. Not only do babies bring joy to a home, but they also provide opportunities for growth. When a baby enters into a home, the children are able to see a healthy example of a loving mother and an involved father. They see how the role of both parents is supposed to look. Because most of the children in the orphanage have histories of abuse and neglect at the hands of their biological parents, bringing a baby into their Christ centered home is crucial to how they will raise their own children someday. We are learning that the process of hiring employees can be an assessment of how good a leader you are. Hiring the right person makes you look like a genius, but hiring the wrong person can make you look like a fool. We recently hired the first missionary under our leadership and she is making us look like we know what we are doing (To confess, she was an easy hire and a superstar). However, we covet your prayers as we seek to hire our first set of house parents. This is a much greater challenge for the following reasons; the job requirements are greater, they speak a different language, their culture is different, the well-being of children is at stake, and they will actually be on the payroll. This is a very important vacancy to fill, a very important decision to make, and one that we absolutely cannot fail at. Please join us in prayer that 1) God sends the right couple 2) we make the right choice and 3) we don’t take it personally if it doesn’t work out. Homeschooling and working is difficult. We have been blessed this current school year with two amazing teachers from the States who have been working with Aramie. They love her and she loves them. However, they will be returning to the States in July. Therefore we are searching for a missionary to replace them, or considering putting her into an American school 30 minutes away. We hear great things about the school, but getting her there everyday will be a tremendous challenge. If you know of anyone who may be interested in teaching Aramie, please pass on their information to us. 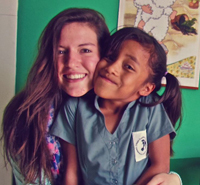 In addition to her school workload, volunteering with our child sponsorship program, and translating when needed, Sierra has added exercise and work to her schedule. She now has a workout partner (new missionary) to keep her motivated and works only when needed at the local coffee shop. Aramie has now earned over 700 of the 1000 required hours of homeschool for the current school year. In addition to learning in the morning, she is now attending the orphanage school in the afternoons, where she landed the lead role in an upcoming play. It’s the perfect role for a girl that loves all things creepy and crawly - a caterpillar that morphs into a butterfly. Jaqui has been working so hard at school and her job that we rarely get to see her. On the rare occasion that she gets to join us for dinner, we celebrate. We are proud to see her handling the “real world” of adulthood, but worry about the demanding hours she keeps. As we all know, it’s a learning process and will pay off in the end. We're so thankful to those of you that have joined us in caring for orphans and widows through your prayers and financial support. This ministry couldn't exist without your help! Please click here to give a monthly or special gift. 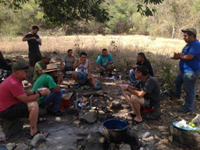 We attended a missionary conference at the beautiful Lake Atitilan this month. 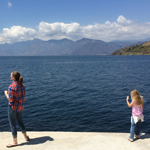 In addition to seeing the beauty of God's creation, we were able to meet a lot of great missionaries living in Guatemala and learn new ways to serve the children in our care. We had another baby! 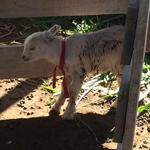 Our goat project is expanding as one of our mama's had a new baby this month. In addition to just bringing smiles to our faces, his birth brings more milk to the project at a time when our milk donations haven't come in. The project is still in it's infancy (see what I did there), but we look forward to the day that we are able to produce sufficient milk to care for our human children. We are still working on making the organization self-sustainable. 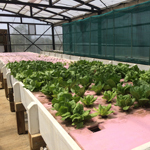 This includes building an aquaponics system that will provide food (fish and vegetables) to our kids on an ongoing basis. 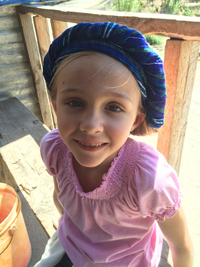 We've run into a few road bumps along the way - everything is a learning process in Guatemala. 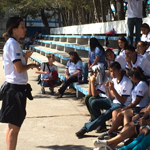 As a result, this month we visited Casa Angelina, another organization, that is very similar. They have been very gracious to share information and we are excited about what' s to come. This just made us laugh and we wanted to share with you. 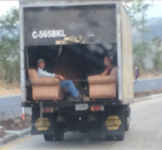 Things are definitely done different here in Guatemala!